Friday Feelers give you actionable insight on real and relevant topics to support you to create real, long-lasting change in your life. Prefer text over audio? I’ve got your back! 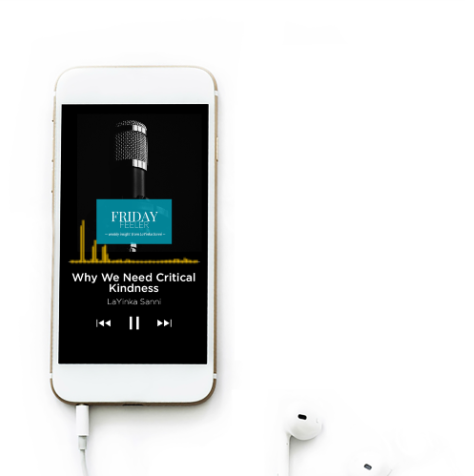 All Friday Feeler podcast episodes have text to go with the audio, in case you’re more of a reader than a listener. I have been through a lot in my 26 years of life. I have been brutally broken. But now I’m collecting my pieces to build my new version. I’m trying to learn how to fall in love with myself and how to overcome negativity, and your audios are really very helpful and motivational. They are empowering me to overcome my fears and move on in life. This really touched me in a way I didn't expect. I read/listen to your Friday feelers for the purpose of making myself the best version of me. I love that you make me think outside the box and outside my small world view and experience. Simply enter your details below, my lovely. Yaaaay! Now go to your email inbox to confirm you'd like to join the Friday Feeler family. Do you wish to join the Friday Feeler family? Do you wish to join the Friday Feeler family? Yup, add me to the Friday Feeler family!